Sony has introduced two new digital binoculars which are capable of capturing video and stills. 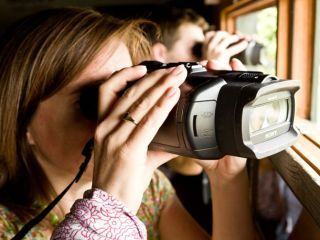 The binoculars are the world's first digital binoculars that record Full HD video with stereo sound. A 3D record mode is also available. Both feature variable zoom, which allow you to scan a wide area before seamlessly zooming in to a given subject, such as a bird. On the DEV-5, optical zoom is available up to 10x, and then expandable up to 20x with digital zoom. The DEV-3 has a maximum magnification of 10x. Most traditional binoculars use manual focus, but the DEV-5 and DEV-3 use electronic autofocus to keep even moving objects sharp at all time. A dial at the top of the camera allows for adjustment of manual focus. Electronic autofocus can be used as close as 1cm away when recording in 2D, or 80cm away when recording in 3D. For 3D images, separate images for left and right are captured by a matched pair of precision G optics by Sony with Exmor R CMOS sensors and BIONZ processors. Independent electronic viewfinders provide images for left and right eyes. The DEV-5 and DEV-3 both use optical Steadyshot, the same optical stabilisation system that's found on Handycam camcorders and Cyber-shot cameras. Optical Steadyshot is designed to keep images crisp and stable, even when viewed at high magnification. The binoculars can be connected via HDMI to any HD television, while 3D videos can be watched on 3D-compatible BRAVIA models. There's also a USB terminal for transferring images and video clips to a computer. The DEV-5 also includes an on-board GPS receiver that automatically geotags video clips. Tagged clips and images can be viewed after shooting in online maps. The binoculars are able to capture still images in 4:3 ratio at 7.1 megapixels, while 16:9 ratio images can be captured at 5.4 megapixels. Head of Testing for Future's Photography Portfolio, Angela Nicholson, was at the press event for TechRadar and spent some time with the binoculars. She said, "Sony's new binoculars are a bit bulkier than other binoculars I've used in the past, but they are also easier to use because of the autofocus system. Nevertheless, I think keen birdwatchers and the like will find digital view a little strange, it makes you feel a little more remote from the subject, almost as if you are watching a TV closely. "I used an early preproduction sample and was not allowed to keep any of the footage or images I shot, so it would be unfair to comment upon the performance which may be enhanced before the binoculars go on sale. However, I found the controls sensibly arranged and easy to get to grips with." Pre-orders can be made with Park Cameras, who will include a free high capacity battery alongside the standard battery with every pre-order. The DEV-5 will retail for approximately £2,300, while the DEV-3 will be priced approximately £1,780, with shipping starting in late October or early November.